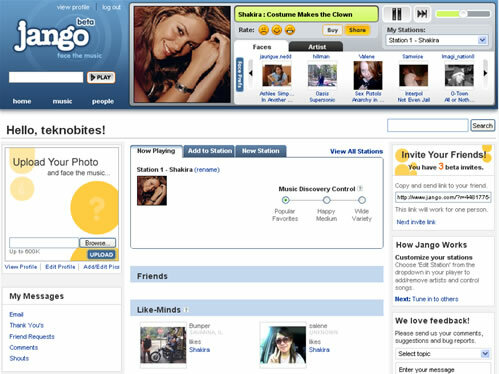 Jango is a new service that lets you listen to your favorite music online for free. You can create stations searching with artists names, once created you can customize the station by adding other artists. You can control what you want to hear in your station by using the slider ranging from Popular Favorites, Happy medium and Wide Variety. The site has social networking features, you can connect with other users with similar interests and listen to their favorites. You can rate the songs you are hearing. It looks like you can buy the music you like and share with others, but these features are not functional. It is definitely a nice site for the music junkies. Currently Jango is in private beta, i have 3 invites to share, drop me a comment if you want to try Jango. Hi there, would love an invite if you’ve got one left, thanks! Hello, I would also be interested in an invitation if there’s still one left for me. Thanks, and crongats for the website.